This isn’t the first time I’ve put in an 18-hour day in a generic conference room in a beautiful city. Last week I put in a few days in San Francisco, and I’ve suffered through Las Vegas and Los Angeles numerous times. Inside, it’s Comic-Con, the annual confab of superheros, superstars, and supernerds. 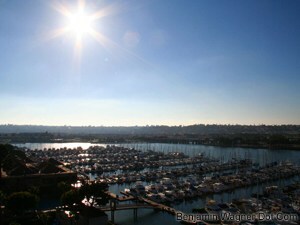 Outside, it’s San Diego: blue skies, sparkling waters, and billowing spinnakers. Today is day one of my five-day journey into uber-fandom: San Diego Comic-Con (comic book geeks) Thursday and Friday, Indianapolis Brickyard 400 (NASCAR nerds) Saturday and Sunday, and New York Springsteen show (music aficionados) Monday. The Comic-Con crowd is something else. It’s as if the trench coat-wearing, anime-loving outcasts who sat at the table on the edge of the lunchroom got their own festival. A good 50% of the 100,000+ attendees are in costume: Storm Troopers, Jokers, Holly Hobby — you name it. For the most part, though, I don’t notice. Where my colleagues are racing between interviews with Keanu Reeves, Kevin Spacey, Hugh Jackman, and Mark Wahlberg, I’m playing air traffic controller in my off-white press room. I did sneak out long enough to see The Rock talk about his new flick, “Race To Witch Mountain,” but only because the scuttlebutt was that Disney was sneaking the trailer for the forthcoming “Tron” sequel, “TR2N,” afterwards. They did. And it was awesome. Still, it’s all a little maddening. I know it was a beautiful day; I saw it through the windows that one time I went to the bathroom. I mean, I slept with the windows open last night, for Heaven’s sake. But then I woke up, went inside, and stayed there for the whole day. One more day, and I’m all about NASCAR. At least they do that outside.